This article has not been published in any other format. It was posted on 29 October 2014. 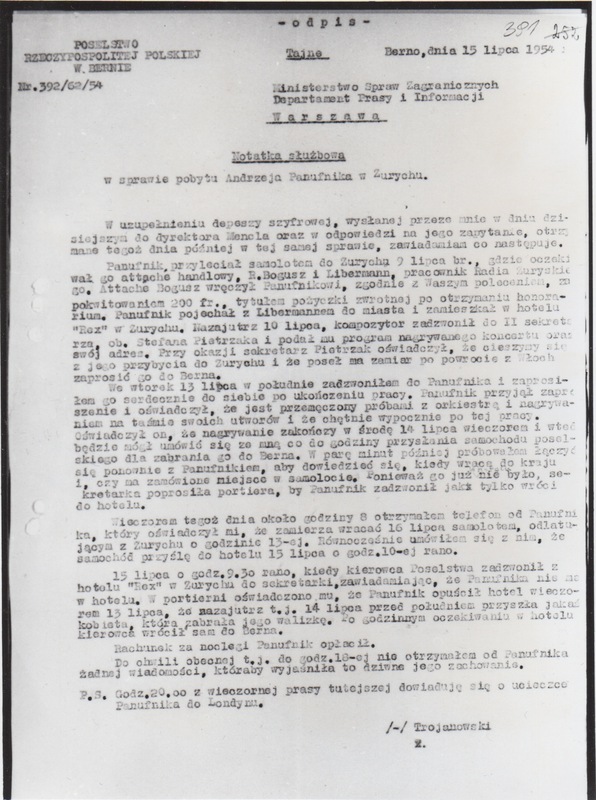 In May 2000, I came across a typewritten copy of a memo from the Polish Legation in Berne to the Polish Ministry of Foreign Affairs in Warsaw. It was dated 15 July 1954 and concerned Andrzej Panufnik’s (now-famous) escape from Zürich to London the day before. I made notes, had a photograph taken, and then slipped it into my files where it has lain undisturbed ever since. I was reminded of it two months ago, when my friend and colleague Danuta Gwizdalanka wrote an article in which she cites most of this document: ‘Ucieczka z państwa grozy‘ (Escape from the State of Terror), Ruch Muzyczny (23 August 2014). So I thought I would dig it out my photo and have another look at it. It raises more questions than it answers. Gwizdalanka’s aim is to measure evidence against testimony. She comments in the first footnote, ‘Already then [1988, when Gwizdalanka reviewed Panufnik’s autobiography Composing Myself (1987), before it had been published in Polish], I drew attention to the frequent discrepancies between the author’s account of Stalinist times and the facts’ (Już wtedy uwagę zwracała częsta rozbieżność między relacjami jej autora na temat czasów stalinowskich a faktami). She goes on to discuss the role of Panufnik’s then wife, Scarlett, her comments and those of fellow composer Roman Palester, who was then a broadcaster on Radio Free Europe. Rather than examine the whole of Gwizdalanka’s new article, I’m going to focus on the document that I think we have both seen. I say ‘think’ because Gwizdalanka describes it as having been sent to the Polish Ministry of the Interior, whereas my document went to the Ministry of Foreign Affairs. Perhaps there are two copies (her file reference is IPN BU 01208/268/J; mine was AAN MKiS tajne paczka 4/2, 32/391). There are minor differences plus a major one that I have indicated in my transcription. What appears below is a photo of the memo that I saw 14 years ago and my (complete) translation. The tension that accompanied [his] contacts with the Polish Embassy in Switzerland, the shadowy undercover agent who did not let Panufnik out of his sight in the hotel or the street, and last of all the taxi chase with the Polish secret service that raced the terrified hero of these events through the streets of Zürich – this highly excited account of the scene in the ‘Escape’ chapter took place in the imagination of the composer. Napięcie towarzyszące kontaktom z polską amabasadą [sic] w Szwajcarii, ponury tajniak nie spuszczający z Panufnika oczu [sic] w hotelu i na ulicy, wreszcie pościg polskich służb bezpieczeństwa za taksówką mknącą z przerażonym bohaterem tych wydarzeń po ulicach Zurychu – tak ekscytująco przedstawione w rozdziale ‘Ucieczka’ sceny rozegrały się w wyobraźni kompozytora. Panufnik’s account is certainly compelling and has a sense of danger that any writer of spy thrillers would envy. Yet one cannot dismiss it out of hand as unreal, and his state of mind – nervy, frightened, even paranoid – is perfectly understandable. Perhaps the details have been filtered ‘through memory and emotion’, as Gwizdalanka puts it. Panufnik’s memory can be faulty or chronologically inaccurate, as has become evident elsewhere in the pre-1954 sections of his autobiography. On the other hand, the Legation’s memo of 15 July 1954 is not, of itself, proof that it is more accurate. • Mencel. This is the hardest name to verify, but a W. Mencel was Director of the Press and Information Department at the Polish Ministry for Foreign Affairs the following year (1955), and a Wiktor Mencel had been First Secretary at the Polish Legation in Paris in 1951. A Wiktor Mencel was also one of eight recipients of the Gold Service Cross, nominated by the Foreign Ministry, on 22 July 1952 and, again nominated by the Foreign Ministry, he was one of over 300 recipients on 10 January 1955 of a medal to mark ten years of People’s Poland. It seems probable that these citations were all for the same person as the Mencel mentioned at the start of the memo. • Libermann [sic]. This is Rolf Liebermann, the Swiss composer, best remembered later as the pioneering director at Hamburg Staatsoper and Opéra de Paris. • R. Bogusz: Commercial Attaché. Full name: Roman Bogusz. • Stefan Pietrzak: Second Secretary, August 1951 – November 1955. • Trojanowski: the author of the memo. Stanisław Trojanowski was the Envoy (head) of the Polish Legation in Berne and had fulfilled the role of Envoyé Extraordinaire and Minister Plenipotentiary to Switzerland since 5 October 1951. The Polish Legation was at Elfenstrasse 20, where the current Embassy is still located. Further to the coded telegram, sent by me today to Director Mencel and in response to his question, received subsequently today on this same matter, I relay the following. Panufnik arrived by plane on 9 July in Zürich, where the Commercial Attaché, R Bogusz, was waiting, plus Libermann, who works at Zürich Radio. Attaché Bogusz handed Panufnik 200 fr., in accordance with Your instructions, against a receipt, by way of a loan repayable once he had been paid his fee. Panufnik went with Libermann into town and settled into Hotel ‘Rex’ in Zürich. The following day, 10 July, the composer phoned to the Second Secretary, cit[izen] Stefan Pietrzak, and gave him the programme for the recording of the concert and his address. Secretary Pietrzak took the opportunity to say that we are pleased with his arrival in Zürich and that the Envoy [in other words, Trojanowski], on his return from Italy, would like to invite him to Berne. On Tuesday 13 July, at noon, I phoned Panufnik and invited him warmly to come here after he had finished his work. Panufnik accepted the invitation, saying that he was exhausted from the orchestral rehearsals and recording his pieces onto tape and that he would be happy to rest after this work. He stated that the recording will finish on the evening of Wednesday 14 July and then he would be able to arrange with me when to send the Legation’s car to take him to Berne. [The next two sentences are omitted from Gwizdalanka’s transcript.] A few minutes later I tried to reach him again, to find out when he was going to return to Poland and if he had booked his seat on the plane. Because he was not still there in the hotel [these last words – w hotelu – are written onto the typed memo], the secretary asked the porter to ask Panufnik to phone as soon as he returned to the hotel. That same evening, at about 8 o’clock, I received a call from Panufnik, who told me that he intended to return on 16 July by plane, flying from Zürich at 13.00 hours. At the same time, I arranged with him that the car will come to the hotel on 15 July at 10 in the morning. On 15 July at 9.30 in the morning, the legation’s driver phoned the secretary from Hotel ‘Rex’ in Zürich, telling her that Panufnik was not at the hotel. From the porter he had learned that Panufnik had left the hotel on the evening of 13 July, and that the next day, i.e. 14 July, before noon, a woman had arrived and taken away his suitcase. After waiting at the hotel for an hour, the driver returned alone to Berne. Panufnik paid the hotel bill. Up till now, i.e. up to 18.00 hours, I have not received any news from Panufnik that would explain his strange behaviour. P.S. At 20.00 hours I found out from the evening papers here about Panufnik’s escape to London. The memo paints an almost benign story: the Legation staff in Berne are solicitous, inviting Panufnik to make the 250-kilometre round-trip from Zürich to Berne and back, by chauffeur-driven car, on his day off (15 July) to meet the head of the Legation (Trojanowski). Contradicting Panufnik’s account, Zürich Radio appears to have arranged Panufnik’s hotel, not the Legation: why else would Panufnik phone the Legation to let them know his address? Panufnik is also able to choose his departure date for Warsaw (16 July) and to book his own ticket (if the Polish authorities had wanted to keep tabs on Panufnik, would they not have booked his hotel and organised the return ticket before he left Warsaw?). The Legation does not hound Panufnik, there is no hint of surveillance of any kind, and Trojanowski is as puzzled as anyone by Panufnik’s ‘strange behaviour’. 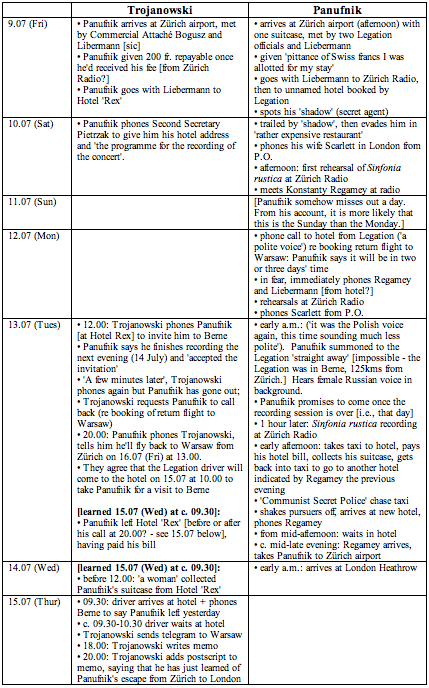 By the look of the memo (timed towards its end as being at 18.00 hours on 15 July), it would appear that Trojanowski (and by implication the rest of the staff in Berne) did not know Panufnik’s whereabouts. Trojanowski had obviously been concerned enough earlier in the day to send a telegram to Mencel in Warsaw, but he was still in the dark as to what had happened to Panufnik. That is, until 20.00 hours, when he added a postscript that he had just learned of Panufnik’s defection from the local evening papers. (The original memo may have been handwritten – this document is an unsigned copy.) Unless the memo is a sophisticated fabrication to cover the backs of the Polish Legation in Berne – that is theoretically plausible, but would Trojanowski have had time to concoct such a scenario? – it comes across as a genuine chronology of his and his staff’s dealings with Panufnik during his stay. The memo was, after all, to the Foreign Ministry so would have to ring true – in terms of the procedures the Legation had followed – to the Envoy’s superiors in Warsaw. There is no anger at having been duped, no indication that there was a failure let alone presence of undercover agents in Zürich, no apology, just bewilderment. Certainly nothing to corroborate Panufnik’s ‘reds-under-the-beds’ tone. Yet, if Panufnik’s story of shaking off his ‘shadow’ on 10 July is correct, is it not all the more likely that he would have been tailed meticulously for the rest of his time in Zürich? In which case, the Legation would have had immediate warning of anything else suspicious. Yet the impression from the memo is that Panufnik was treated with respect, deference and implicit trust, not with suspicion. So is Gwizdalanka right to say that key parts of Panufnik’s story were figments of his imagination? Is Trojanowski’s matter-of-fact chronology genuine? Or had the Legation bungled its operations and did not want to admit it? And is it possible that there was top-secret surveillance going on of which the Legation was unaware? You will have to judge for yourself. Get hold of a copy of Chapter 19 of Panufnik’s Composing Myself and go compare.